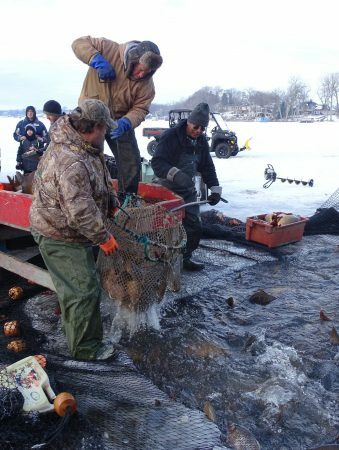 In a record-setting event on January 18th, the Prior Lake-Spring Lake Watershed District’s consultants, WSB & Associates, coordinated the efforts by Geyer Commercial Fishing, LLC to capture an astounding 35,000 pounds (17 tons) of carp with their nets below the ice of Upper Prior Lake. A large hole was cut in the ice and carp were pulled out of the lake over three days. The carp were then loaded onto two semi-trucks outfitted with water tanks to keep them alive on their way to fish markets: one in New York and then game lakes in the southern states where carp are prized by fishermen. Upper Prior Lake poses many challenges to commercial fishermen: natural rocks and uncharted debris at the lake bottom, steep drop-offs and varying bathymetry, curly-leaf pondweed mats, and an infestation of zebra mussels. Due to these challenges, this carp removal was the first commercially viable netting of carp ever conducted on Upper Prior. Future carp netting operations will now be met with more optimism, given the success of this harvest. 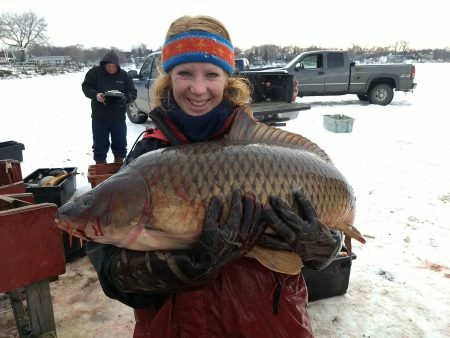 This big carp haul represents only a portion of the total carp population in Upper Prior Lake. While approximately 3,000 carp were removed, that’s estimated to be just under 20% of the population; an estimated 17,000 carp (approximately 200,000 lbs.) may still be swimming in the lake. The largest fish captured during the netting was over three feet in length and weighed in at a whopping 42 pounds! Scientists estimate that this fish could be over 50 years old. Radio-tags were previously implanted into 20 carp and released back into Upper Prior Lake. These carp acted as spies for the Watershed District, sending out signals that located their position in the lake. If the carp group together again later this winter and/or spring, the Watershed District will work quickly to conduct another seine in the hopes that the population will reach a manageable level. This project is part of an integrated pest management strategy that includes tracking the movement and population of carp, targeted carp removals, identifying spawning areas and installing carp barriers. 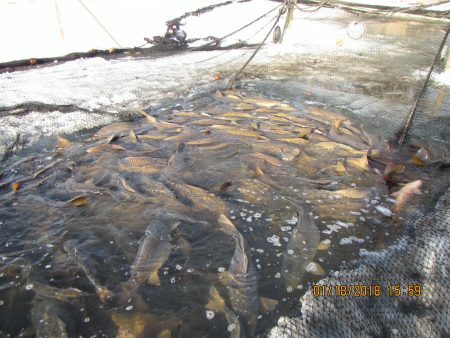 Partially funded by a MN Pollution Control Agency grant for carp management through the Clean Water Partnership, the project covers the three connected lakes—Spring, Upper Prior and Lower Prior Lakes. For more information, visit the Carp Management page on our website. For pictures of the carp seine, visit the District’s Facebook page.